This May, the SUNY College at Brockport will begin construction on an ambitious project to transform the core of its north campus according to a $12 million site design prepared by TWMLA and C&S Companies. The project initially was conceived to replace aging subsurface utilities. 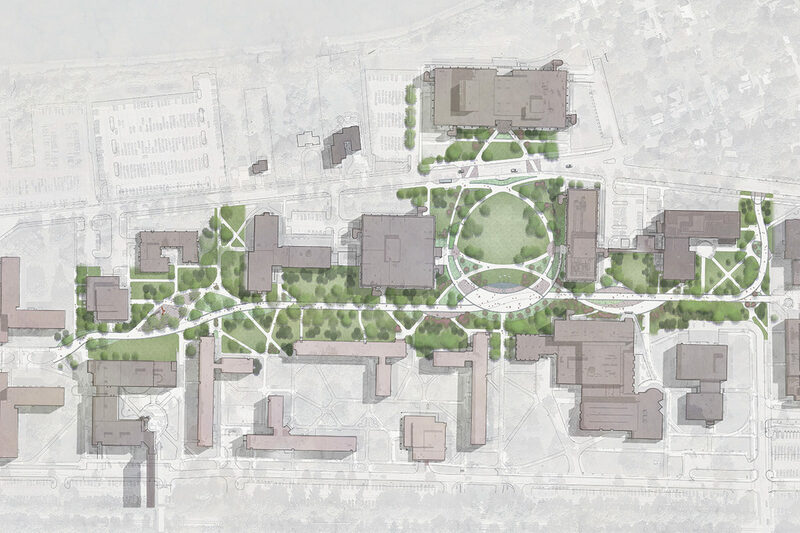 The campus and design team realized that the extent of site disturbance necessary for the utility work provided an excellent opportunity to redesign the campus landscape. Prior to preparing any design concepts, TWMLA did an extensive analysis of all sidewalks and trees in the 75-acre north campus area, which informed the conceptualization and overall site design. Doing individual tree-by-tree assessments allowed TWMLA to make informed decisions about which trees merited extra efforts to mitigate the negative effects resulting from the major underground infrastructure work. TWMLA’s new site design will replace a dated, confusing system of sidewalks with a new pedestrian network that provides intuitive ways of getting around campus. At the heart of the project, a crumbling 12’ tall brick wall will be replaced with gently sloped green space, allowing for new, ADA accessible pathways. A new pedestrian spine will act as a common thread uniting a number of disjointed areas, while also serving as a new route for emergency vehicle access. Gathering spaces in various sizes will allow for flexible programing uses. The design team also focused on a number of green infrastructure methods for storm water management. A system of permeable gutters will direct runoff into lushly planted rain gardens, and porous plaza spaces reduce impervious surface area. The project also features ambitious tree planting. For every tree taken down, the College will be planting two new trees, a progressive step that is being taken to ensure that the campus continues to feature a healthy tree canopy into the future.